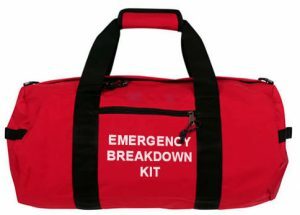 A car emergency / safety / breakdown kit is an assortment of vital supplies that are often neglected until of course, when they’re needed. Some new cars come with a very basic kit, though these are limited and often need to be extended. Car safety emergency kits come in various forms including first aid kits, breakdown kits, winter kits and European travel kits. kits can be purchased in pre-packed form and vary considerably in price from a basic package of around £15, up to around £200 for an extensive kit. Purchasing a pre-packaged safety kit is solution ideal to some as requires very little effort other than making the purchase itself. However, some prefer to make the kit themselves simply because they already have many of the components required, or they can’t find a pre-packed safety kit that covers their specific needs and intends on purchasing the items individually. Covered in this section is what goes in a car emergency kit, the various components recommended for car first aid, breakdown, winter travel and European travel kits. Use the check lists below as a guide for how to make your own specific kit for your requirements. This car emergency breakdown kit should contain the above first aid kit within its own bag. This check list will assemble a basic emergency roadside breakdown kit. Torch (ideally waterproof) & batteries and spares. Or a windup torch. Bottle containing engine coolant – if your engine overheats, this can cool it down and get you going again. See what is engine coolant. Bottle containing windscreen washer fluid – driving in muddy, wet spray from other vehicles can be hazardous if you’re unable to clear your front windscreen. 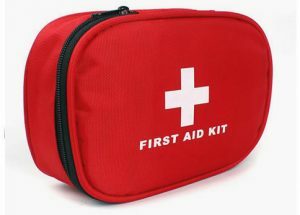 These items are to be included with the first aid kit and the emergency breakdown kit as above. This European travel car kit is a legal recommendation for traveling through European Union countries. The items you are legally obliged to carry in your car depend on which country you are in at any given. If you are stopped by the police in an EU country where you are not carrying a compulsory component from the list below based on their laws, a fine will be imposed. The European travel car kit check list below will enable you to drive in all EU countries legally. If you are intending on driving to European countries, see driving in Europe for further information. Breathalyser Kit – though this is a legal requirement only in France, there is no fine for non-compliance, so it’s your choice essentially whether to pack this item. Headlamp converters – there is a fine imposed if your vehicle has not had its headlamps converted. Please note however, some vehicles headlights are designed to work for driving on either side of the road and do not require converting. Check with your manufacturer or vehicle manual. GB sticker – GB Stickers are compulsory within the EU unless your UK registration plates display the GB Euro-symbol. Warning triangle – this is compulsory to display in the event of a breakdown in the majority of EU countries. High visibility jacket – a hi-vis jacket is compulsory to be worn in the event of a breakdown in certain EU countries. First aid kit – a first aid kit is currently compulsory only in Austria.